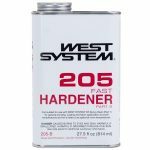 West System 205 Fast Hardener - Goosebay Sawmill and Lumber, Inc.
205 Fast Hardener is a medium-viscosity epoxy curing agent. It is used in a majority of bonding situations, at lower temperatures, and to produce a rapid cure that develops its physical properties quickly at room temperature. When mixed with WEST SYSTEM 105 Resin in a five-part resin to one-part hardener ratio, the cured resin/hardener mixture yields a rigid, high-strength, moisture-resistant solid with excellent bonding and coating properties. 205 Fast Hardener is not intended for clear coating. We can special order Fast Hardener 205-C (.94 gal). Special orders are subject to minimum quantities but can often be an “add on” to our regular restocking order. Once ordered, arrival time at our store is usually within 2 business days.